There are two kinds of years – Leap Years and common years. Do you want another common year? Haven’t you had enough of them? Why not make this an uncommon year, and achieve your dreams 24-7-366. If you are ready to completely change your life in the next 366 days, then you are ready for this book – and for Bill’s unique strategies for success. You will be amazed at how simple it is, and you will love the results. Start your Leap Year today! 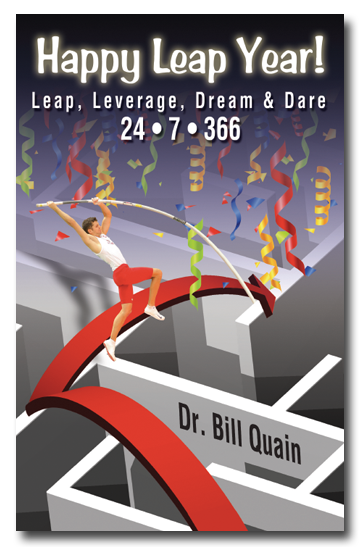 Bill Quain is the author of 20 books on marketing, personal growth and wealth-building. He has sold over 2 million copies, in many languages. Bill does not accept excuses – from his clients, or from himself. He is legally blind from Macular Degeneration. Yet, he maintains a busy schedule, traveling, writing, and coaching other authors. Bill is a graduate of Cornell University, Florida International University, and the University of New Orleans. He was a college professor for twenty-five years, and he now teaches part-time at a college in New Jersey.